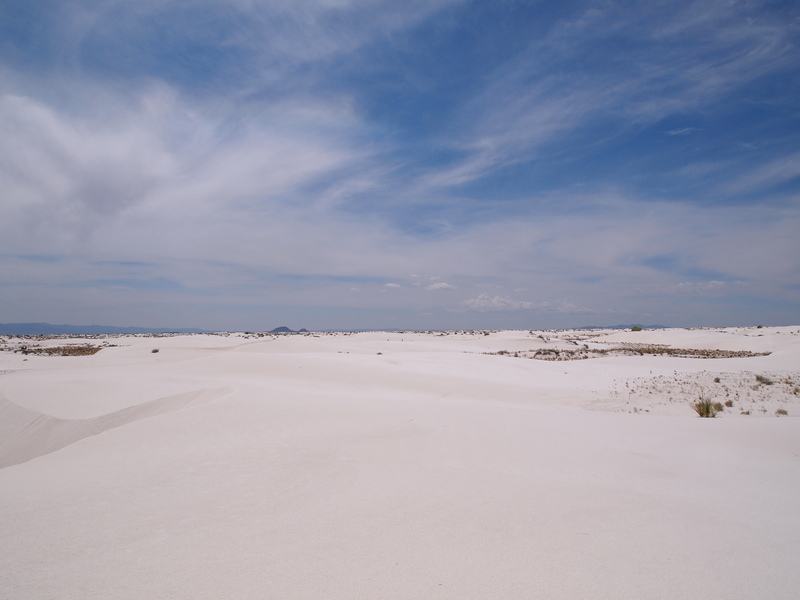 Surrounded by the San Andreas Mountains to the west and the Sacramento Mountains to the east, the Tularosa Basin is home to White Sands National Monument. 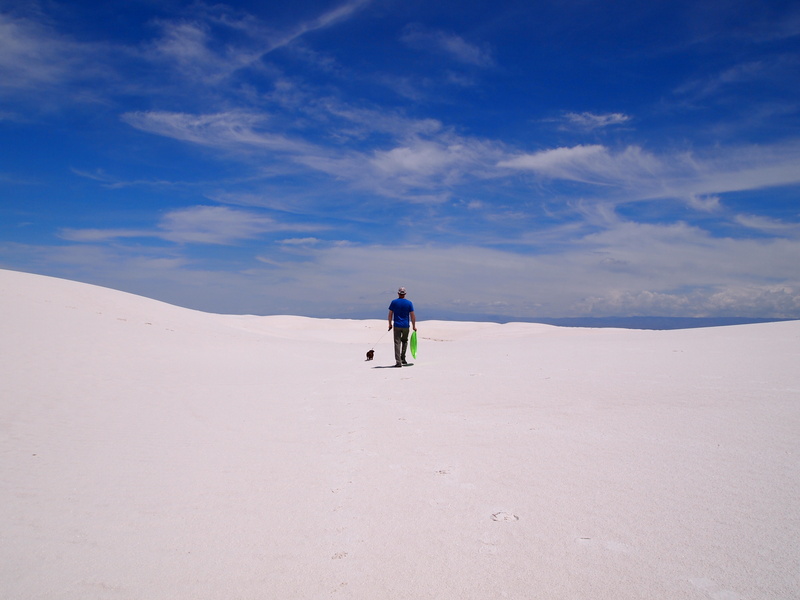 The dunes at White Sands aren’t composed of the sand typically found at the beach, rather, they are dunes of gypsum sand. Rain and snow over the San Andreas Mts. 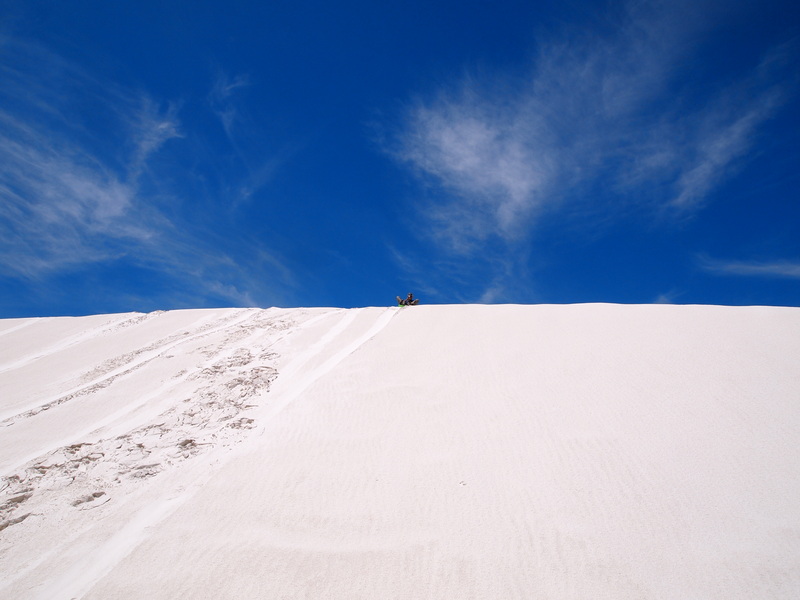 pick up the gypsum and dissolve it. 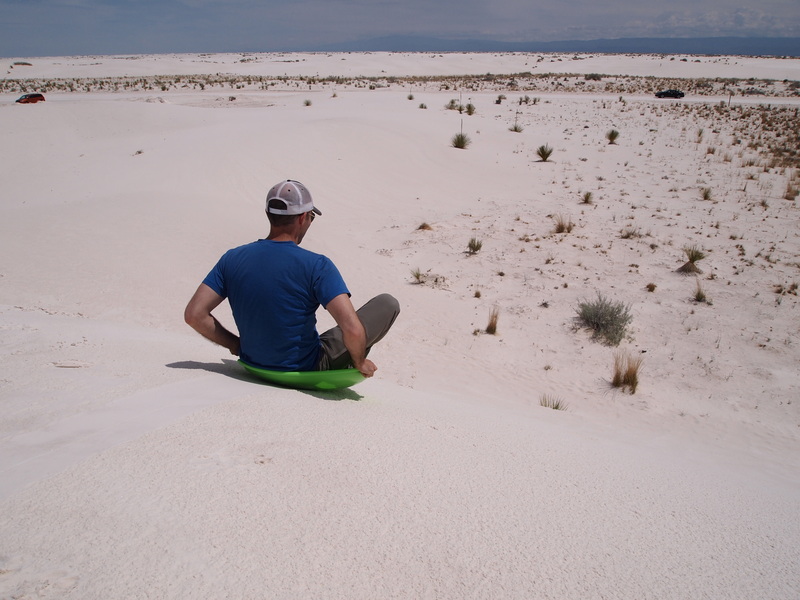 Typically, this dissolved gypsum would be dumped into rivers and then flow to the sea, however, in the Tularosa Basin there’s no access to the sea, so the water from rain and snow is trapped in the basin. 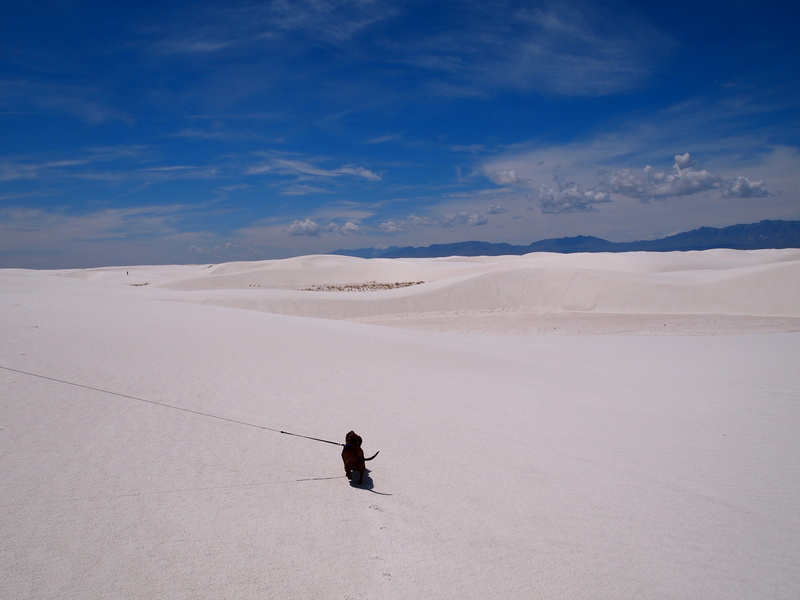 This gypsum crystallizes and eventually breaks down into particles small enough to be carried by the wind. 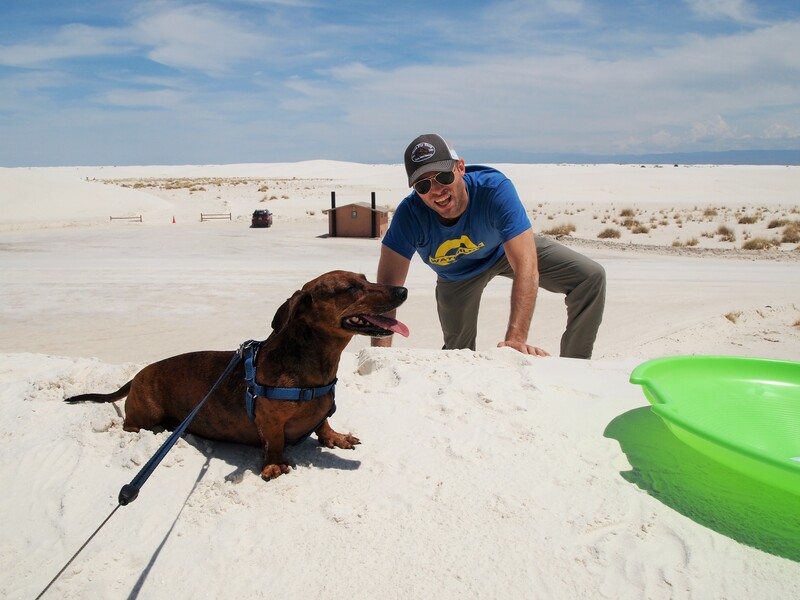 The gypsum sand doesn’t absorb heat, so Truman could walk around without burning his paw pads. 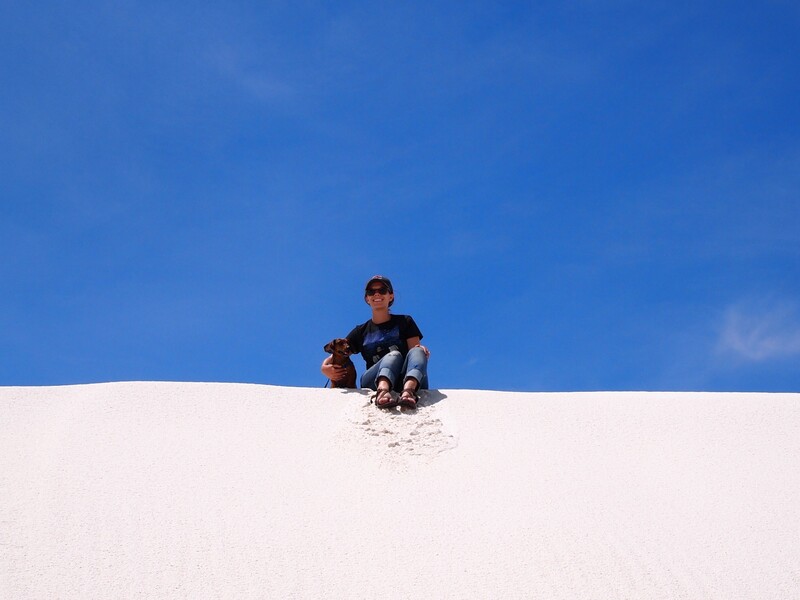 However, the color of the sand is blindingly white in the middle of the day and because of that it’s difficult to distinguish the dunes in my photos, something I didn’t notice when we were there. 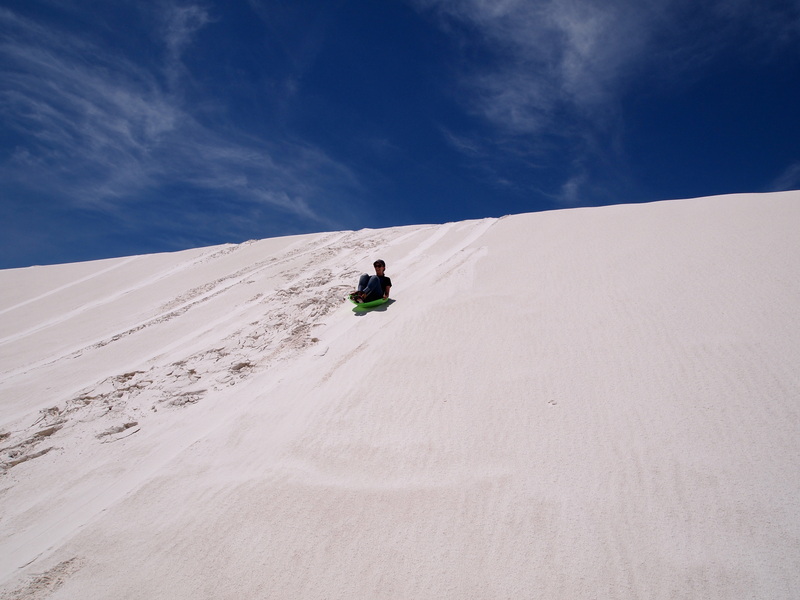 We drove into the visitor center parking lot around 1pm and Zach went inside to get a sled. 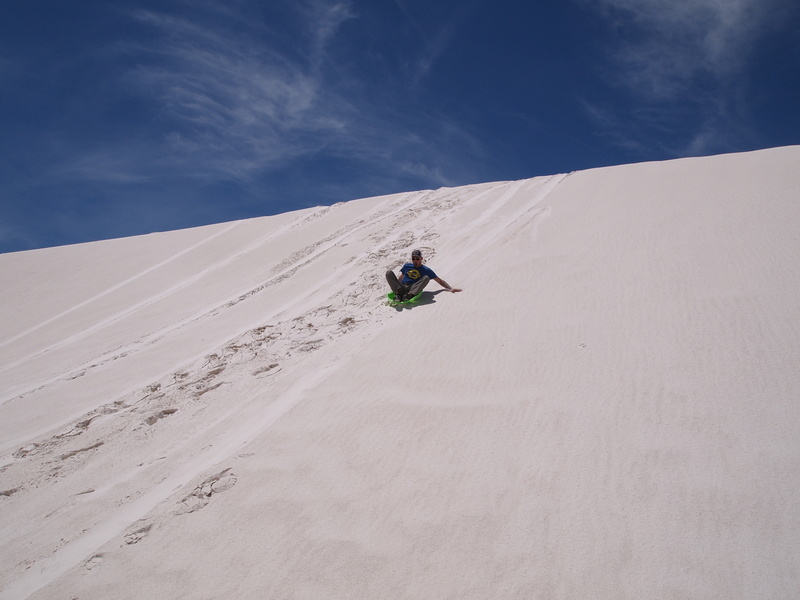 If you have a sled of your own, bring it! 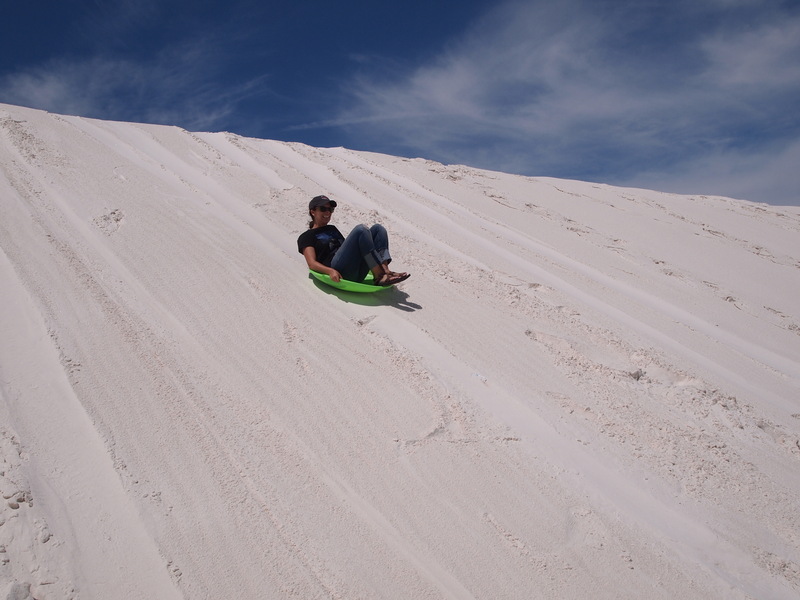 The sleds at the visitor center are $18 ($10 if they have any used ones) and you can sell it back to the shop for only $5 – not a great deal… They also sell large chunks of wax for $2 but we weren’t willing to go that far. The National Monument contains 115 sq. 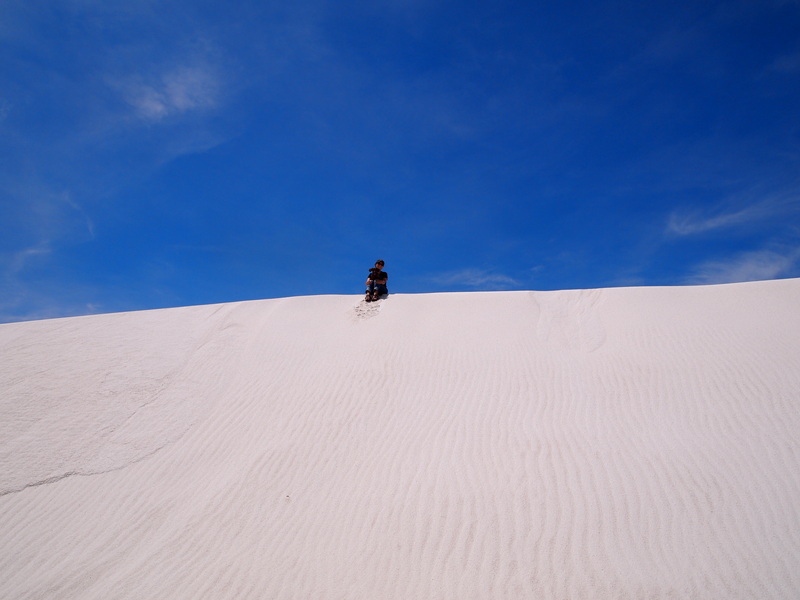 miles of dunes but most visitors, like us, will only see the small portion off of Dunes Drive. 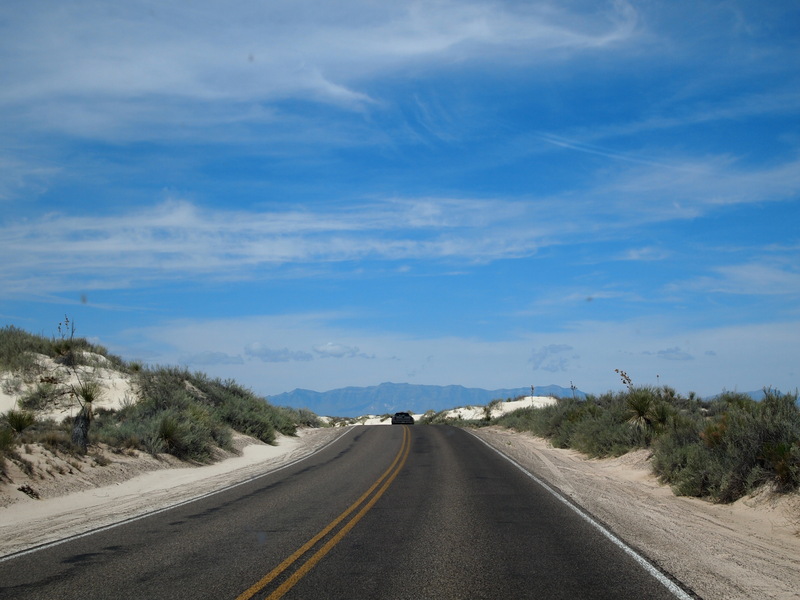 The first mile or so of the drive is a safety corridor and vehicles can’t stop or pull off the road; once past the corridor, there are plenty of spots to park and play in the dunes. We stopped at a few different spots along the drive, until it was evident that Truman might die if we continued playing. Several groups set up chairs and umbrellas like they were visiting the beach and camped out for the afternoon. I guess if you like sand and hate water, this is the place for you! Personally, I prefer sand with the ocean nearby. Even though it was pretty hot, we had a fantastic time. 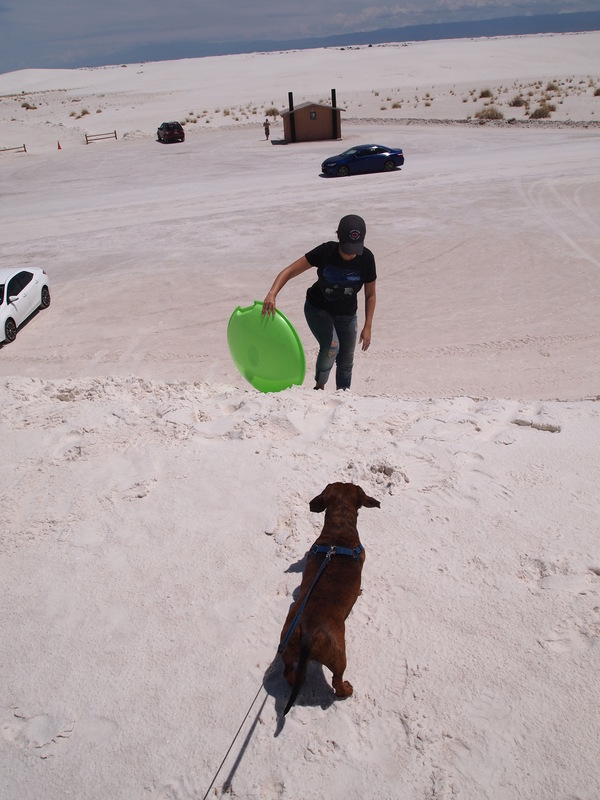 Truman thoroughly enjoyed running around the dunes; I haven’t seen him so excited in a while. 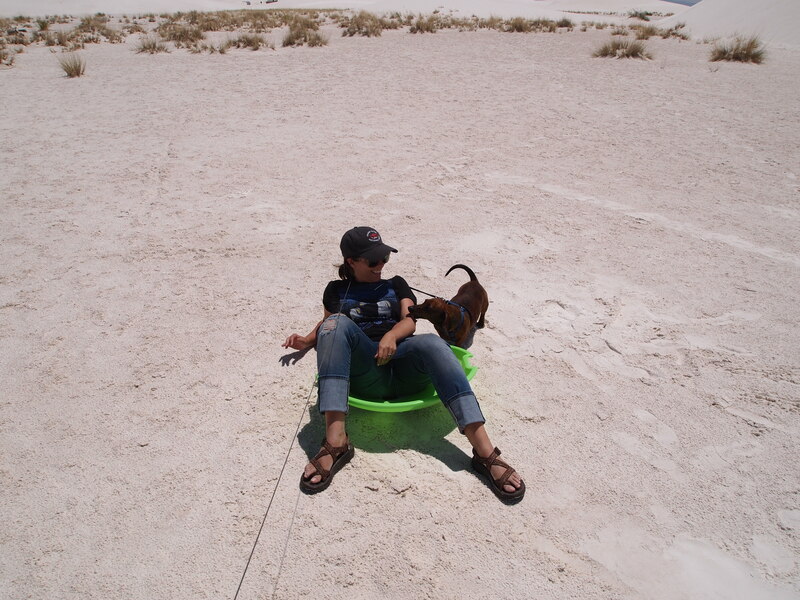 He was particularly concerned each time we slid down a dune on the sled though – alternately barking and crying . If we had gone in the evening, I think he would have run around for hours. 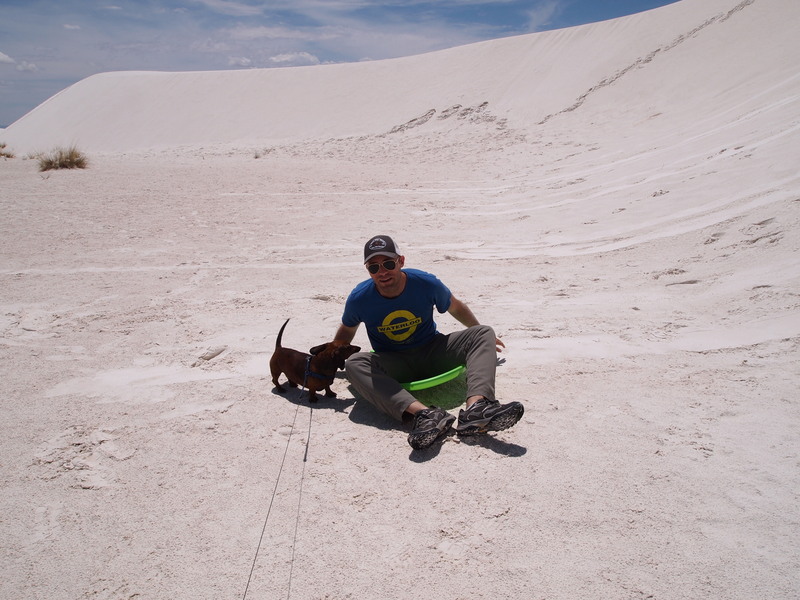 It would have been fun to have a picnic at one of the Monument’s picnic sites, but we needed to get on the road. 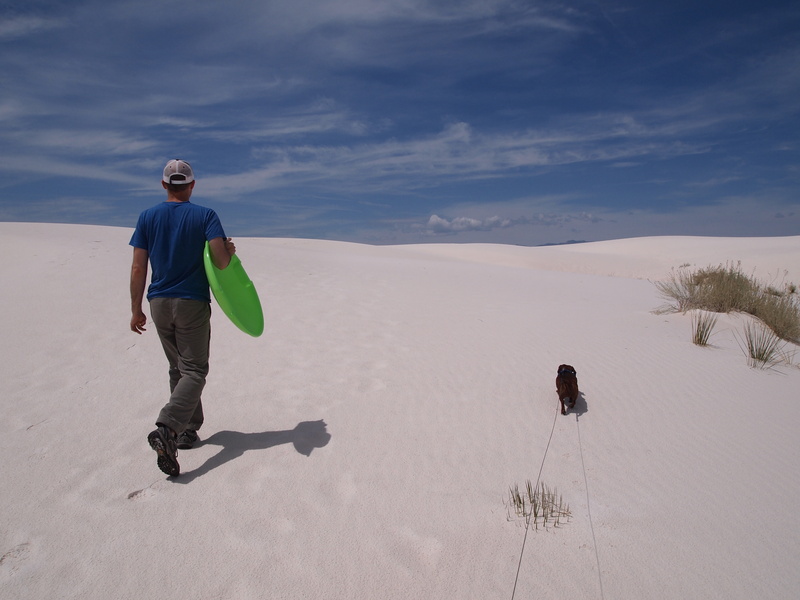 Maybe next time, White Sands.